This self-titled album by Gifts From Enola is by no means their debut record, but already the third one of this busy quartet from Virginia. Founded in 2005, they released their first CD already one year later, followed by a split-record in 2008 and the second longplayer last year. 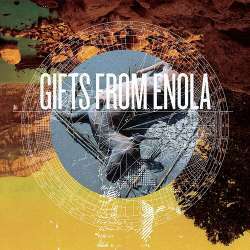 Gifts From Enola are a quasi-instrumental (there are vocals, but they rarely don’t add much to the song) band using elements of post rock and math rock resulting in long compositions relying heavily on the excellent guitar work. Alternating between more contemplative moments and frenetic finger acrobatics, all five tracks manage to keep their suspense throughout their lengths ranging from six to eight and a half minutes. There is no denying that we are in the presence of talented musicians whose years of performing and recording experience show throughout the album, but they have chosen a genre where innovation is hard to come by. The harsh vocals on Dime And Suture, which unfortunately drown in the mix, actually work rather well and help adding even more depth to the music. Fans of post rock and math rock are definitely at the right address with this young band who has certainly not yet reached its zenith. The only major complaint is the short running time of just under forty minutes, making one wonder if one additional song might have been possible.